Throughout the entire Art Show we are holding a raffle in conjunction with the Marion Art Group. This year Lee-Anne Kling has kindly donated her lovely painting "The Waves of Mount Sonder" as first Prize. "The Waves of Mount Sonder"
Lee-Anne Marie Kling. The donor of our raffle painting this year and a member of Marion Art Group. She has enjoyed painting since childhood. In the early 1980's she took classes with Arthur Phillips and later, in Melbourne with Geoff Rogers. Raising a family got in the way of art and for 19 years the paints, brushes and canvas remained packed away in an old suitcase under the bed, even after moving back to Adelaide in 1998. Around 209, Lee-Anne sensed God calling her back to art. Her two sons encouraged her too. 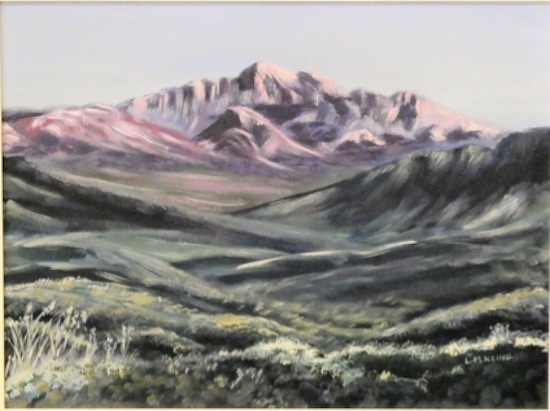 After painting several months with a friend, she joined the Marion Art Group where, she has been a committee member and over the last few years, editor of the newsletter. * Support for children fighting with chronic and complex bladder and bowel conditions which require surgical intervention.